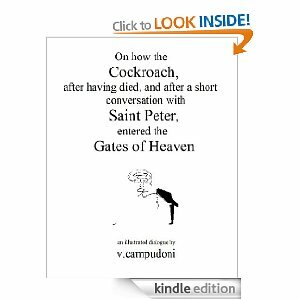 V. Campudoni’s illustrated short story – On how the Cockroach, after having died, and after a short conversation with Saint Peter, entered the Gates of Heaven – is a sort of modern-day Socratic dialogue, in which a humble cockroach is pitted against a sanctimonious Saint Peter. As the proverbial keeper of the pearly gates, Saint Peter offers various excuses to deny the cockroach entry to the kingdom of Heaven, even as he lets through a succession of figures who appear to contradict the very logic of those excuses, e.g. he first insists that to enter Heaven one must be as tall as himself, and then permits someone shorter than him to pass through the gates. Saint Peter’s pompous manner comes across most clearly when he tells the cockroach, ‘I will miss you greatly. Our time together shall not be forgotten. Moments like these are to be treasured like gold, savored like wine, captured like a smile on canvas. […] You have enriched me and I shall never be the same.’ The exchange is later parodied after the cockroach has persuaded him to bring out ‘the smallest, tiniest, portion of bread’, which it then proceeds to lavish with extravagant praise, hailing the moment of charity with the same words that Saint Peter has already used. As charming as the dialogue between the cockroach and Saint Peter is, the overall story is not without its minor problems. On the one hand, the increasingly ridiculous reasons Saint Peter provides do make for some amusingly polite exchanges with the cockroach. Yet on the other, their repetitive nature also somewhat belabours the clearly evident point being made about religious hypocrisy through the story. Also problematic is the manner in which the cockroach eventually does make it through the gates of Heaven. Proceeding in ostensibly Socratic fashion, the cockroach succeeds in convincing Saint Peter that ‘if the perception that [they] are standing outside of the gates is indeed not reality’, ‘the alternative must be that [they] are standing within the gates’. The trouble is, of course, that the assertion depends on the assumption that perception and reality must always be ‘Completely different’, eliding the possibility of their coincidence. For a story whose exchanges otherwise rely on sound logic, however absurd the premises from which that logic is derived, this sleight of hand feels disingenuous. Since this is a review of a chapbook designed for the Kindle, in the interests of full disclosure I should mention that I have never owned one. Nor do I plan to, no matter how shiny the various companies make their e-readers. (To be fair, I do read on my iPhone, but mainly stuff on McSweeney’s Small Chair app that has been specially formatted for it.) I probably own enough books to start my own library lending service, and though my bookshelves at home and at university are groaning under the weight, I would not have it any other way. This is less a case of my hating the digital revolution, and more a case of my remaining largely indifferent to this aspect of it. 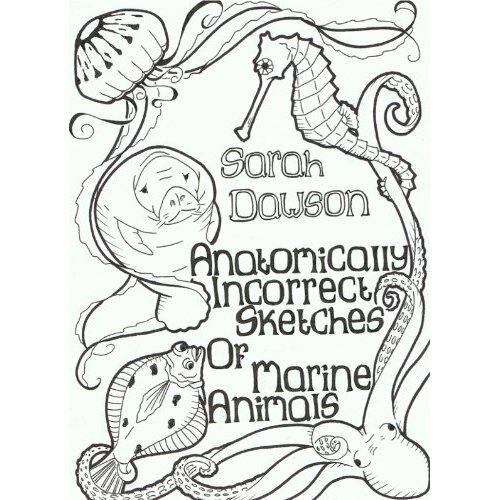 Frankly, the experience of reading Sarah Dawson’s chapbook, Anatomically Incorrect Sketches of Marine Animals, has not changed my mind about e-books. This, however, has absolutely nothing to do with the quality of the poetry or its presentation, both of which are excellent. On her blog Poetry After Ink, Dawson states that her goal was to self-publish a group of poems she was proud of. As for choosing the Kindle format? In her own words, ‘I kept reading that formatting poetry for Kindle was close to impossible, and I wanted to prove it wasn’t.’ I read the chapbook on both the Kindle for iPhone and for PC apps, and I have to say that whatever Dawson did in terms of formatting (details in this blog entry), it works perfectly, e.g. line breaks are preserved when resizing the text. There is a patterning of sounds in this poem, an ebb and flow to the manner in which they appear, go away, reemerge in new configurations. The image of the ‘silken laundry sea’ introduced in the second couplet regulates the rest of the poem’s sounds. The fish become transformed into ‘silk scraps’, as if they have merged with the sea at an essential level. Yet when the poem performs its own merging by pulling in the ‘m’ sound from the first couplet, a curious moment of linguistic play occurs. Pronouncing a word like ‘unhemmed’ presses the lips together, but the meaning points to something coming undone. Cleverly, ‘seam’ is also linguistically janiform, since it can mean both a junction and a fissure. The tension between these two impulses, to join and to separate, is caught up again by the last line, where ‘brushed’ echoes ‘breaststroke’ in the first, even as the fish are still trapped in ‘coats they ached to shrug off’. It is inconceivable not to acknowledge such patterned economy of language as deserving admiration. Another example of Dawson’s craftsmanship occurs in ‘Lug worms, rag worms’. On her blog, Dawson mentions that this poem began life as a pantoum, which she subsequently edited down. The version that appears in the chapbook has been pared down further, and while no longer recognisable as a pantoum per se, still does something interesting in the way bits of the repeated lines seemingly ‘burrow’ into each other, like ‘worms’ moving through the ‘sand’ of the poem. As the poem comes to a graceful finish, ‘Plucked from / our burrows, now exposed, our frayed threads / antagonize each other’, the compass of its central metaphor expands to connect worms and people in the same predicament, the threat of being ‘exposed’, of being made vulnerable. Where a lesser poet might have worked in a pun on ‘bristle’ and linked it with ‘antagonize’, Dawson’s use of the unrepeated ‘exposed’ stands out as a moment of subtlety. Earlier, I stated my lack of interest in e-books. (At least when it comes to buying my own reading material. I read plenty of digital stuff for reviews!) To reiterate, this has never been a value judgement, but purely a question of personal preference. Perhaps then, the highest compliment I can pay Dawson’s chapbook in closing is to say that had it been published as a physical chapbook, I would have happily bought it, which is what I normally do anyway when I read something I like online that is also sold in hard copy. As it stands though, in the case of Dawson’s chapbook e-reader converts certainly have one up on people like me, and I am glad to admit it.